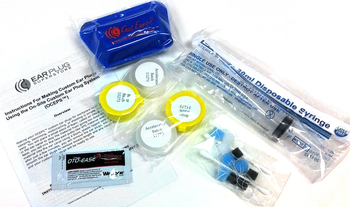 OCEPS™ On-Site Custom Ear Plug System trial kit is designed to let you evaluate the OCEPS™ system at your location, but without the commitment of having to buy a full set of materials and supplies. If you just need one or two sets of custom ear plugs, the OCEPS™ trial kit will provide you with everything you need to make your own personal set of custom ear plugs. For those who are going to be using OCEPS™ to make custom ear plugs for others in the workplace, at a shooting range, motorcycle rally, race track or other public or private location, we recommend that you obtain training from a local audiologist or EENT physician. If you need assistance in acquiring training, we will be happy to provide a referral to a qualified trainer. Just let us know and we will refer you: or call 918-478-5500. Two sets of OCEPS™ VPS silicone material, enough to make two pairs of full-ear custom ear plugs. Two pairs of Oto-Blocks in each of three sizes: Small, Medium and Large, which let you plug the canal so that VPS material cannot go deeper than you want. Two Q-Tips to be used to place the Oto-Blocks in each ear. One plastic tipped syringe that allows you to accurately and safely flow the VPS material into the ear, forming a perfect custom ear plug. One single use packet of Oto-Ease custom ear plug lubricant. Order OCEPS™ components and accessories including handles, pouches, lanyards, VPS material and more. Learn how OCEPS™ lets you produce top quality full custom ear plugs, while eliminating the hassles, delays and high cost of obtaining lab made custom ear plugs. OCEPS On-Site Custom Ear Plug System Trial Kit5RobAugust 11, 2018I was tired of my ear buds slipping out while windsurfing. I molded the silicone around a set of earbuds. I was happy with the results, kept the water out and minimized the wind noise so I didn't have to turn the volume up high to hear my music. OCEPS On-Site Custom Ear Plug System Trial Kit5BrettNovember 20, 2017This is the best DIY value out there and the finished product is comforable and quiet. Read the instructions - if the product is too warm when you start you will need to act very fast and be strong enough to push the plunger. OCEPS On-Site Custom Ear Plug System Trial Kit2DanielOctober 4, 2017Was unable to make earplugs due to how fast the material cured. Had my son help me. We couldn't do it fast enough to inject material into the ear canal. Material set up so fast we couldn't get it out of the plastic plunger. Kit came with everything needed. But the silicone material was basically unusable. Was a disappointment. OCEPS On-Site Custom Ear Plug System Trial Kit2Frank GalinAugust 7, 2015Disappointed on how fast medium set up. Need 1 minute longer to stay soft, couldn't get last 3 cc to come out of syringe. Need to put warning in instruction on how fast this compound sets up. OCEPS On-Site Custom Ear Plug System Trial Kit4Gordon ThompsonDecember 5, 2014Overall the instructions were good and the process went well. A friend helped. We were both a little surprise at how fast the product set up and will do better the next time. I think the lanyard is just about a must as I don't want to remove the plugs temporarily into a grimy pocket. I would like to have been prompted to order that as part of the order process. I plan to order a couple of lanyards and a second "squeeze box" soon.